What are the causes of the most common sports-related injuries? For recreational and elite athletes muscle overuse or taking on too much too quickly is a primary factor. General wear and tear on the joints, or areas of the body subjected to repeated activity, is another. Then there’s failure to properly warm up muscles and joints before beginning physical activity. Accidents, poor technique, improper training and incorrect gear are more reasons that we may get injured or hurt while exercising or participating in sports. While some injuries are beyond our control, many are preventable with adequate warmup, proper technique and training. Good judgment and some common sense can help keep you safe and reduce the chances of a potentially sidelining injury. Taking precautionary steps can decrease the likelihood of injury. Be sure to engage in pre-participation conditioning before diving headlong into any new exercise or sports program, as unaccustomed exercise can result in muscle overuse, sprains, tears, or delayed onset muscle pain and stiffness. Continuing and pushing yourself too hard once muscle fatigue sets in, increases the risk of multiple injuries. Quit while you are ahead of the game, and let your body rest and recover to enable you to play another day. Take precautions, as once you have had an injury, such as a hamstring sprain or tear, the risk of injury occurrence increases. Prevention should focus on increasing strength and endurance with periods of rest. Muscle pulls and tears – When muscle fibers are stretched beyond their capacity or a muscle is subjected to sudden force, some muscle fibers can tear, resulting in a pulled muscle. A muscle tear occurs when most of the fibers are affected. Working your muscles regularly and light stretching before and during exercise, and a deeper stretch afterwards when muscles are warm helps the body to stay limber, which is a good strategy for preventing muscle injury. Runner’s knee – More than half of all sports injuries involve a variety of aches and pains related to the knee cap, including torn ligaments and cartilage. Runner’s knee can affect cyclists, swimmers, ball players, and aerobics aficionados, as well as runners, sprinters and joggers. Knee injury may result from overuse, which can lead to irritation of the tendon below the kneecap, or from a misaligned knee cap that can wear down cartilage and cause fluid buildup, pain, and swelling. Weight training and isometric exercises that strengthen the quadriceps help to prevent knee injury by realigning and supporting the knee cap. Replace shoes regularly and cross train to prevent overuse of the knee joint. Shin splints – Pain in the muscles attached to the shin bones are generally caused by tears due to overuse, exercising on hard surfaces, improper shoe support or concentrated speed work. A slow warm up, athletic shoes with good arch support, compression sleeves, incrementally increasing intensity and exercising on a softer surface can help to prevent shin splints. Tennis and golf elbow – Tennis players, golfers, weight lifters and baseball pitchers can be plagued by tennis elbow, an inflammation of the forearm muscles and the tendon that connects muscles to the elbow, causing pain on the either side of the elbow. Proper sports alignment and technique, along with strengthening exercises, can help to improve forearm strength. Lessons from a tennis or golf pro can help correct swing problems to help avoid muscle overuse and fatigue. Lower back strain – More likely to occur among sedentary or overweight people than athletes, lower back pain and muscle spasms, that often seem to come out of nowhere, are largely the result of weak or tense muscles. Athletes and enthusiasts who participate in sports that involve unilateral motions, such as tennis, golf, and martial arts, as well as cycling and running, are more prone to back injuries. Proper warm up is critical in preventing back pain. Regular stretching and exercises that strengthen, not only the back muscles, but also the abdominal and hamstring muscles, can help to prevent back strain and stiffness. 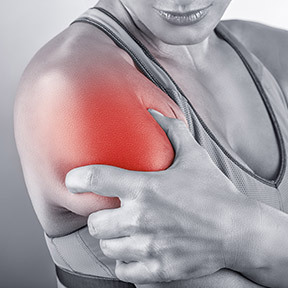 Shoulder injuries – Shoulder injuries often occur among those who participate in tennis, swimming, weightlifting, volleyball, or any activity that involves overhead movement. Overuse, training errors, or improper technique can cause problems including sprains, strains, dislocations or tendon impingement, resulting in inflammation, limited range of motion and pain. Gradual weight training can help to strengthen the shoulder to reduce the risk of injury. If an injury does occur, seek medical advice as needed, and protect against further injury by restricting activity, applying ice for 20 minutes every 2 hours for 48 hours after injury, and reduce swelling by elevating the injured area and applying a compression bandage when appropriate. Muscle-Aid by BioGenesis Nutraceuticals: This professional strength powdered formula provides a blend of vitamins, minerals and amino acid chelates plus L-glutamine and L-carnitine for optimal energy support and healthy muscle recovery. Muscle-Aid helps to control muscle spasms and alleviate cramping, while reducing myalgia and other pains and providing support for cardiovascular health. Tense-X by Professional Botanicals: This highly absorbable proprietary formula provides a blend of adaptogens and relaxing botanicals formulated to support muscle and general relaxation, and calm nerves and muscle spasms due to injury or fatigue. Gluten free, Non-GMO formulation. Amino Sport™ by Biotics® Research: This broad-spectrum professional formula provides a superior and balanced blend of amino acids in support of energy requirements, rehabilitation protocols and muscle building. Gluten free formulation. ON SALE Collagen Sport Ultimate Recovery Complex French Vanilla by NeoCell: This advanced bioavailable naturally flavored whey protein/collagen powdered formula provides vitamins, minerals and amino acids in support of muscle recovery, and healthy ligaments and joints, as well as healthy aging. Gluten, sugar and lactose free. Also available in Belgian Chocolate flavor. Compression Leg Sleeves by Zensah: These top selling leg sleeves provide runners and athletes with targeted compression for calf support, shin splint relief and decreased fatigue. Great for runners, golfers, tennis and basketball players, the physically active, and all athletes who want to take their sport to the next level. Made with durable comfortable fabric. Available in a variety of sizes and colors. Machine wash/line dry. Knee Sleeve, Elbow Sleeve, Thigh Sleeve, and Plantar Fasciitis Sleeve also available. This entry was posted in Home and tagged Amino Sport™ by Biotics® Research, Collagen Sport Ultimate Recovery Complex French Vanilla by NeoCell, Compression Leg Sleeves by Zensah, Lower back strain, Muscle pulls and tears, Muscle-Aid by BioGenesis Nutraceuticals, Quick Tips for Sports Injury Prevention, Runner’s knee, Shin splints, Shoulder injuries, Tennis and golf elbow, Tense-X by Professional Botanicals. Bookmark the permalink.